For small groups only, (less than 100 people) including preschools, libraries, and birthday parties, this is the comedy magic show which has earned Mr. Magichead universal praise among discerning moms and early childhood professionals. Fresh, original, full of surprises, and polished in over 7,000 performances over the last 20+ years, The Stupendous Mr. Magichead Show is consistently acknowledged as "the funniest children's show ever". 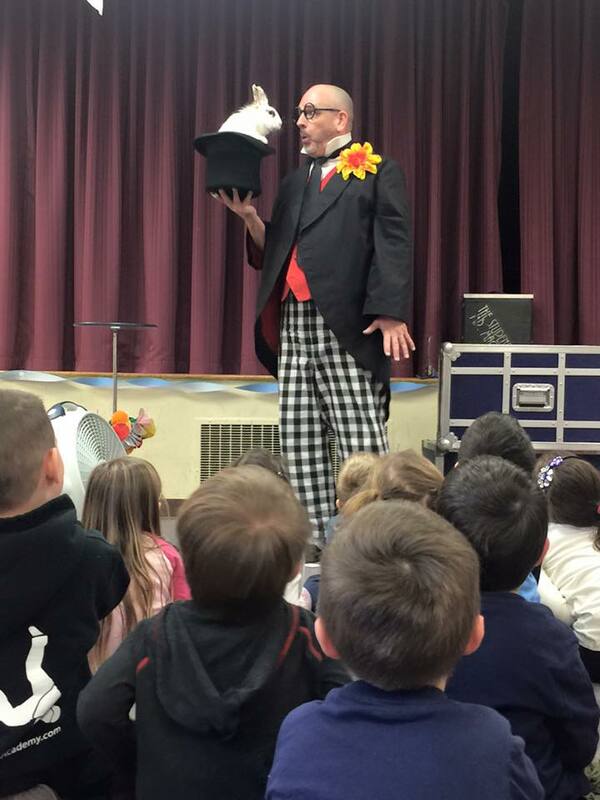 Aimed at children ages 3-10 and their families, his quickly-paced costumed character magic show features extensive audience interaction, plenty of clowning around, and trickery that will mystify even the most sophisticated grown-ups, including an actual appearance of Lulu The Magic Bunny in an empty hat! Mr. Magichead personally guarantees that "your kids will be sitting down, laughing their heads off, for 50 solid minutes". The performance is followed by 10/15 minutes of bunny petting and photo opportunities. *No travel fee in Worcester, Shrewsbury, Grafton, Millbury, Auburn, Leicester, Paxton, Holden, West Boylston and Boylston. 1. Party planners please note - Mr. Magichead has a "no grown-ups talking during the show" policy. If your party plan includes adults socializing during the performance, the children's magic show must be presented in a separate, quieter space. 2. The show must be positioned in such a way as to prevent backstage or on-stage viewing of the performance. Against a wall or kitty corner often works best, but in any event there must be a straight line which extends from wall to wall, with the performer on one side and everyone else on the other side. Special arrangements can be made if this is not possible. 3. Mr. Magichead is committed to providing an outstanding performance for your young guests and therefore in the interest of "distraction reduction" we prefer that no food or beverages be served to the children just before or during the show, and suggest that balloons, goody bags and piñatas be scheduled after the magic show. 4. Outdoor shows can be staged where the sun will not be in the audience's eyes, on a flat & level surface, with no backstage views. Outdoor shows on sweltering days must be held in an area shaded for both the audience and performer. Self-contained including theatre-quality PA system, this ideal elementary school assembly and spree day performance is a one-man/one-bunny "go-anywhere" show equally at home in a cafeteria, gymnasium, theatre, field, or under a tent. Bigger, funnier, and faster, this show is perfect for medium to large (600+ people) size groups. Length of performance is 45-55 minutes followed (when appropriate) by meeting/greeting, bunny petting, and photo opportunities. $495.00 plus $0.50 per mile round trip from Worcester MA. No travel fee in Worcester MA & surrounding towns of Shrewsbury MA, Grafton MA, Millbury MA, Auburn MA, Leicester MA, Paxton MA, Holden MA, West Boylston MA and Boylston MA. Ten years in the making, this is the biggest, most amazing one-man children's/family magic act in it's price range! Combining the experience of over 5,000 performances as Mr. Magichead with his desire to reach larger audiences has resulted in this truly stupendous show. Logistically, it's a big van filled with road cases, PA equipment, curtains, custom-made costumes, mind-boggling illusions, The Stupendous Mr. Magichead himself, and (shh-don't tell anybody) five of the cutest bunnies in show business. On stage, for children of all ages, it's just pure magic. Performance length is 55 - 70 minutes. Designed to dazzle audiences large and small, but due to space requirements may not be available in some venues! $0.50 per mi. round trip within 100 mi. of Worcester MA. $0.75 per mi. round trip beyond 100 mi. of Worcester.